Kubernetes on AWS took the lead as containers moved slightly away from on-premises deployment in a recent survey on cloud native technologies that was issued last week by Cloud Native Computing Foundation (CNCF) as part of its KubeCon and CloudNativeCon events in Austin, Texas. According to CNCF, over 550 people took time to take the survey, with 55 percent working in businesses with fewer than 500 employees and 28 percent in companies employing more than 5,000. Thirty-seven percent identified themselves as DevOps; 29 percent as developers. Only 44 percent said they worked in the technology industry, which I suppose means the remainder are IT workers for non-tech companies. As you might expect, Kubernetes took the lead as the container orchestration tool of choice, with Docker Swarm, Mesos, OpenShift, CloudFoundry, and the home grown options Shell Scripts and CAPS all seeing a decline since the last survey in March. However, the folks at CNCF indicate there has been an uptick in use of managed container orchestrators such as Google Container Engine (now Google Kubernetes Engine) and Amazon ECS, indicating that as organizations move workloads to public clouds, many are relying on the cloud's branded and supported tools. Also gaining users is Rancher, an open source container management platform from Rancher Labs, which also produces RancherOS, a simplified Linux distribution for hosting containers. By this time next year Amazon will be competing with itself as far as Kubernetes on AWS goes. The world's largest public cloud recently announced it's embracing Kubernetes and that sometime in 2018 it will make a new service, Amazon Elastic Container Service for Kubernetes, or EKS, available. Currently all instances of Kubernetes on AWS are user installed. Most interesting, to me at least, is the location where containers are being employed. In a nutshell, this boils down to on-premises or on AWS, Google or Azure. However, use of the also-ran DigitalOcean cloud doubled since the last survey, from 7 percent to 14 percent, which seems to make DigitalOcean a cloud to watch. Otherwise, the biggest gainer was AWS, which rose six point in the results, to 69 percent. The survey indicates that the use of Kubernetes mirrors the results for the top container deployment environments. On-prem deployments took a sharp drop between the March and December surveys, declining from 65 percent to 51 percent. Although at first glance this might seem to indicate a decline in on-prem data centers, that might not be the case. Instead, this might only indicate a shift in the nature of container use. Since June of last year, container use for development purposes has held steady at about 89 percent, and testing has been steady at about 84 percent since last November. During the same periods, production use has been on a sharp rise, from 57 percent in June 2016 (according to a Google survey), to 75 percent today on the CNCF survey. Since containers used in production are often going to be cloud borne, this may account for much of the percentage drop in on-prem container deployments. 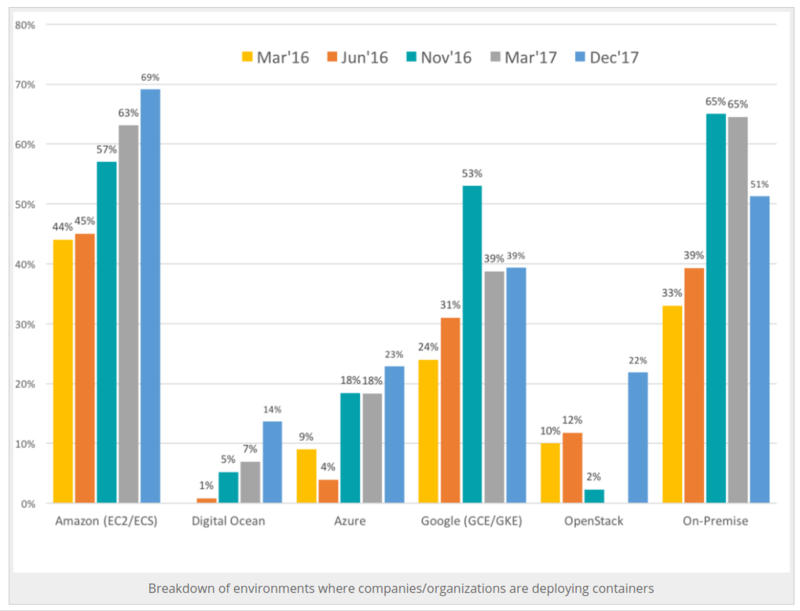 The number of containers being deployed by organizations is also on the rise, with nearly half of the survey's respondents saying that their company currently deploys over 250 containers. This has led to new challenges for DevOps and developers. Monitoring and scaling deployments, were added to this latest survey's results, with monitoring only being outpaced by challenges posed by storage and security issues. 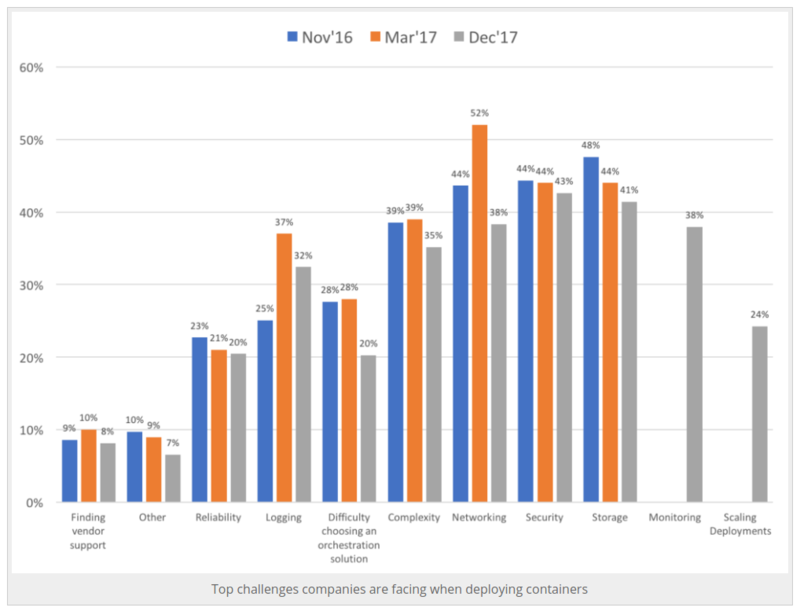 Except for the two new challenges, concerns about all challenges facing container users are on the decline. Most notably, concerns about networking showed a huge drop, from 52 percent to 38 percent.